Looking for some awesome facts about the Galapagos blue-footed booby? Enjoy these 11 far-out facts about these strange blue-footed birds! 1. The blueness of their feet comes from their diet of fresh fish. 2. Male and female are nearly identical. 3. Their nostrils are permanently sealed shut. 4. Males mainly dive in shallow water. 6. Blue-footed boobies have a special air sac in their skulls to protect their brains. 7. The male dances to attract a mate. 8. The female lays 2-3 small, bluish eggs. 9. Mates can recognize one another by their calls. 10. Blue-footed boobies will defecate around and on their eggs. Blue-footed boobies are definitely a different sort of bird. The first time I saw them was in the Galapagos when I was only ten. The blue feet and quizzical looks made quite the impression, but the name was what really sold it. The boobies walk funny, whistle and honk, and make sarcastic remarks at the tourists, thus earning their name. Okay, so maybe they don't verbalize their quips, but you can see it in their small, beady eyes! Color: Their wings are brown and come down to a point at their butts (what? I like the word). Their head and neck are salt and pepper, but their bellies and underside are a vibrant white. Their beak is a dark grayish blue, and the irises of the eyes are a pale yellow. And, of course, their feet are a beautiful sky blue. Cool feature: One-half of all blue-footed boobies nest in the Galapagos, making this a great place to see them. The boobies live on the Pacific coast, from California all the way down to Peru and on the Galapagos Islands. The boobies are mainly marine birds; they spend very little time on land much of which is used for breeding and clown training for the little ones. It's actually a substance called carotenoid; these are antioxidants that improve the immune system. If a blue-footed booby has pale feet, it likely means that they are unhealthy. Foot blueness of both genders is key in their mating rituals. A male or female with bright blue feet is much more likely to find a mate than a male or female with pale feet. However, they do have various distinguishing marks. The male is slightly smaller and has a soft whistle for a mating call, whereas the female is larger and utilizes a very loud honking noise. The pupil of the female's eye is slightly larger and star shaped, whereas the male has more yellow in his iris. Why you even need nostrils when they are utterly useless is anyone's guess; perhaps they have a highly developed fashion sense. The group will hunt by dive-bombing a school of fish or squid. Since they enter the water like high-speed arrows, they can't have the water spearing up their nostrils and scrambling their brains. They dive from an altitude of around 100 feet (30 m) (though it is possible from up to 330 ft! ), hit the water at 60 mph, and can dive down 82 ft! Since the males are smaller, they will tend to hunt closer to shore, leaving the deep dives to the heavier females. The male's small size and larger tail make it easier for him to hunt in shallower waters because he can change direction much easier once submerged. The females are larger so they can carry more fish back from their long trips. This was really interesting to me considering that most bird groups are called “flocks.” I particularly like congress… I wonder if they have little powdered white wigs? While not entirely accurate, bubble brain is a fitting name for a blue-footed booby. Because they dive from such high heights to such deep depths, their skulls have a special kind of air bubble to protect their brains from this immense pressure. Unfortunately, I don't have a super-special-bubble-brain-thing; as I painfully learned when I took that 30-minute diving class that one time. I did not like it. Diving is not my thing. 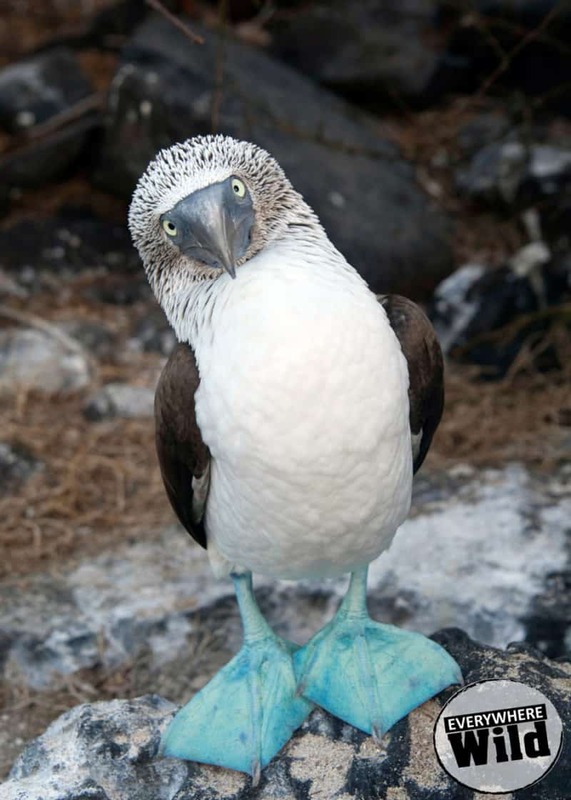 The male booby will dance for his bride by stomping around marching-band style proudly displaying his blue feet. They will then extend their wings outward and point blue bills skyward. Male and female will circle each other for a few minutes, stomping, whistling, and honking. Clowning around, if you will. Both parents stay for about two months to care for the chicks. The chicks have such fluffy white feathers they will often appear larger than their parents.When there is not enough food for all the chicks, the larger will become dominate and hog all the food thus leaving the smaller, frailer ones to starve. Blue-footed booby siblings are not very close. Say what? That's right! Blue-footed boobies build their nests in small depressions in the black lava. (Extra Fact! The Galapagos Islands are made up almost entirely of hardened black lava!) After they get comfy in their lava nests, the female lays her eggs. Since she will always face the sun while sitting on the eggs, the nest is surrounded by a circular ring of bright, white poop! What the what? A brooding patch is a small, featherless patch of skin on the underside of most birds, and is visible in the nesting season. This area is well supplied with blood vessels to help keep the egg warm. In a nutshell, it's an egg-shaped warming pouch. Anyway, blue-footed boobies don't have this. They use their lovely blue webbed feet to keep their eggs warm. Although the feet are blue, the color has nothing to do with the blood flow. In other words, it works well to keep the eggs warm. The boobies are a very popular tourist attractions and the local vendors in Galapagos have a bunch of awesome souvenirs made in their blueish honor. We saw this guy in an art gallery on Santa Cruz, Galapagos. You can buy these funny shirts everywhere in the Galapagos! Those are my 11 awesome blue-footed booby facts! These are awesome birds and really fun to watch. Please tell me in the comments wich fact was your favorite or one that I missed. One of the most awesome “fun/interesting facts” article that I have ever read! Thank you so much, I’m glad you enjoyed it! Let me know if you have any questions, I can try to answer them 😉. And let me know if there is an animal you would like me to cover and I will try to cover it! Thanks again 😊. I don’t have a favorite comment because they were all so humorously written along with fun facts to appeal to all ages and all levels of comprehension. The child in me enjoyed reading and learning and seeing these strange and beautiful creatures.